The Winnipeg Humane Society’s emergency response team has had some pretty odd calls over the years, but likely nothing otter than one it received Friday afternoon. 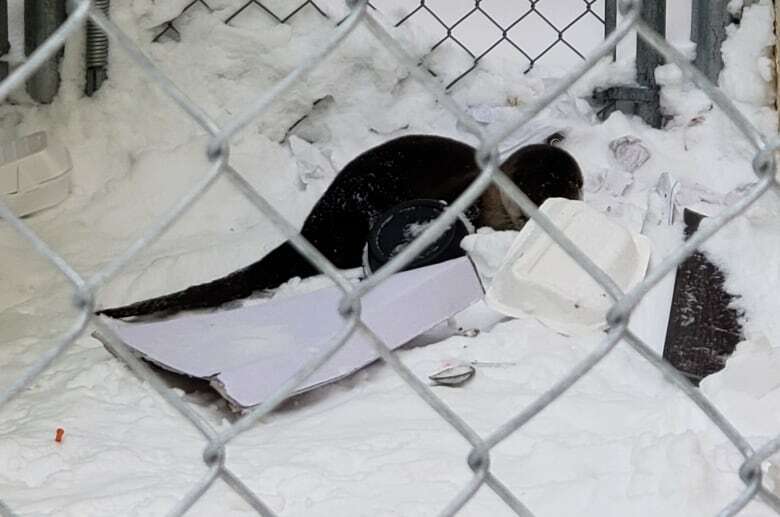 The agency responded to a report of an otter living under a downtown dumpster. Nihal Bhullar, a 20-year-old University of Winnipeg student, called authorities after stumbling along the otter over her lunch hour. Bhullar was walking back to class when she noticed a small crowd around a garbage bin between two apartments on Balmoral Street, across from the university’s east doors. Bhullar thought she had misheard the man who told her there was an otter under the garbage. Eventually the crowd dispersed, and Bhullar found herself alone with the otter. “I thought, ‘I’ve got to call someone because he clearly does not belong here,'” she said. Bhullar was joined by Dawn Williams, who lives in the apartment at 391 Balmoral St. next to the otter’s chosen dumpster, and the pair waited for help to arrive. Bhullar said they talked to the otter and made sure the misplaced mammal didn’t leave the safety of the garbage can. They also gave the otter a name. “We called him Otty the otter,” laughed Bhullar. The pair said Otty looked healthy and happy enough to be living under a garbage can, at least until until crews arrived. That’s when Otty took off running, said Bhullar. “He managed to escape from them and run under a fence, and then he went under another fence and another one after that,” she said. After his flight, Otty ended up in a gap behind the apartments. Thankfully, Williams was there to let rescuers in the front of the apartment block and lead them to the back door where they came face to face with the wily animal. “We have him tucked away, we keep the lights dim and kind of keep him away from people so we don’t cause him any stress,” she told CBC News. Neil can’t say why or how the otter got under the dumpster, but figures Otty had been there for a few days based on reports they had received and the fact the otter had built a pair of small slides in the snow leading to the dumpster — just like the animal does to get down riverbanks in the wild. “We don’t come across otters, generally, you see them along the riverbanks, and that’s where their natural habitat is, but this one was quite a ways away from the river,” she said. 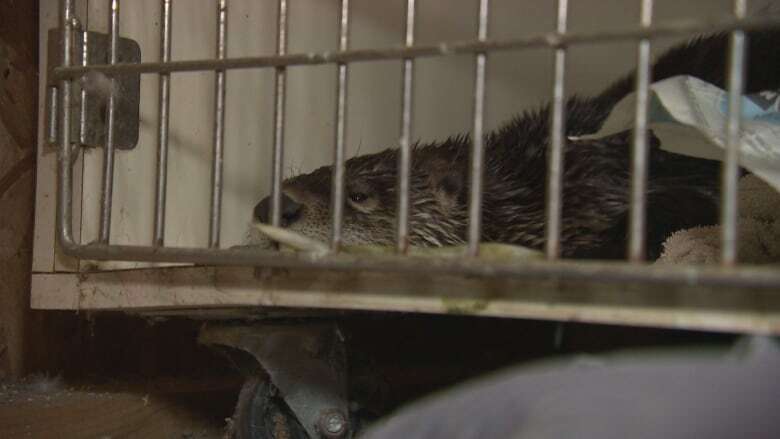 She said it’s the first time the humane society had received a call about an otter. A spokesperson from Manitoba Conservation said otters can live within city limits along the Red River and have occasionally been reported roaming in the city. 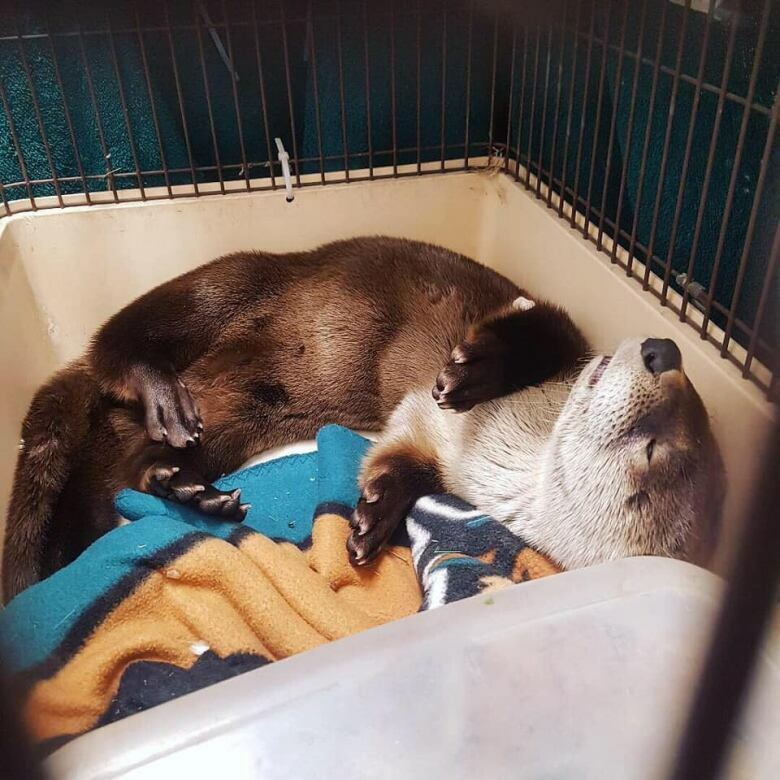 Otty was taken to a Wildlife Haven Rehabilitation Centre, where director and animal care volunteer Dan Diawol said the out-of-the-water otter has been relaxing on a soft towel and enjoying a diet of frozen fish. Diawol said Otty, a male around a year old, came in weighing around six kilograms — a little on the light side for an otter — but otherwise healthy and with no physical injuries. “He seemed in fairly good shape, generally speaking,” he said. He doesn’t know for sure, but Diawol thinks the otter may have came up from the Assiniboine River to start his adventures in downtown Winnipeg. “If they have a den, they’ll keep an opening available — kind of like a ice fishing kind of thing — where they’ll be able to go into the water,” he said. Diawol said it’s unusual, but not concerning, to find an otter wandering the streets of Winnipeg. 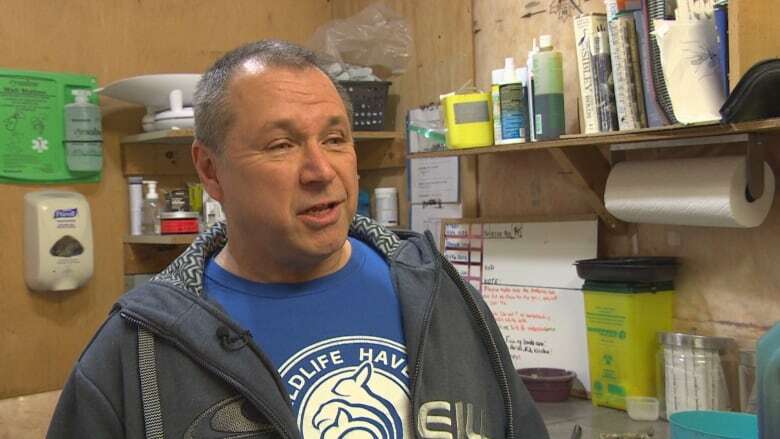 “There’s wildlife everywhere in urban areas and in most cases we just simply don’t see them,” he said, adding the otter-spotters did the right thing to notify the humane society. “In many case, they should be leaving wildlife alone,” said Diawol. Diawol said the centre will work with Manitoba Sustainable Development to decide where and when to release the intrepid otter back into the wild.